The mission of Think More is to help the people of the North to think more by creating exciting and dynamic events. Keep coming back to this site for news of events we've done which satisfy a hunger for new ideas and for the intellectually curious. These will cover sport, culture, cities, politics, faith, ideas, science, art and more. A Downtown Manchester conference on the challenges and opportunities for Manchester as a modern business location. Contributors to the conference included city leader Sir Richard Leese, chief executive Sir Howard Bernstein, Salford City Council chief Barbara Spicer, Manchester International Festival Managing Director Alex Poots, architect Ian Simpson, chairman of the Halle Orchestra David McKeith, chairman of Manchester Digital Tony Foggatt and Lou Cordwell of Magnetic North. 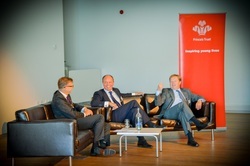 Tuesday 25th September 2012 at Liverpool John Moores University, supporting the Prince's Trust, the North West Leadership annual interview heard Sir Charles Dunstone, Chairman and Co-founder of the Carphone Warehouse Group plc and Sir Michael Bibby, Managing Director of The Bibby Line Group and The Chair of The Prince’s Trust Liverpool Committee. In the questioner's hot seat was journalist and broadcaster Michael Taylor. An expert panel at the Lowry Hotel Manchester we discovered how some of the most successful social brands found success, and got insider tips from some of the UK's leading social media strategists. Michael Taylor interviewed Ian Simpson, at a CityCo City Sessions event. 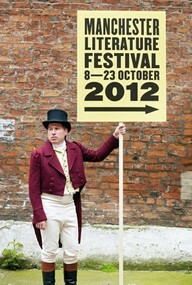 Monday 11th September 2012 at Marks and Clerks, New York Street, Manchester. Ian Simpson is an architect with an ambition to use powerful design to lead the regeneration of post-industrial cities. In Manchester, his most notable and emblematic project to date is the Beetham Tower. Think More and Journey9 were delighted to partner with the leading speaker agency, JLA and the Lowry Hotel at a special event on July 3 hosted by Michael Taylor. The Agenda was attended by 100 specially invited guests who heard four inspiring speakers sharing their stories. AV and production was provided and managed by Project Eventus. The evening was a unique chance for senior decision-makers and conference organisers to preview speakers who can help inform, inspire and galvanise audiences. With a line-up featuring broadcaster Nicky Campbell (above, with Laura Wolfe from Journey9), Will Butler-Adams of Brompton Bicycle Company, Dame Eliza Manningham-Buller, former Head of MI5 and Wilfred Emanuel-Jones, founder, ‘The Black Farmer’, The Agenda focussed on key messages for business both big and small. If you would like any further information about the evening, or if you would like to talk to us about making this happen for you, please contact Michael Heaven. Professor Brian Cox delivered the Cockford Rutherford annual lecture in Manchester on the 20th of June. Michael Taylor, founder of Think More, is on the board of the University of Manchester Alumni Association, organisers of the lecture. 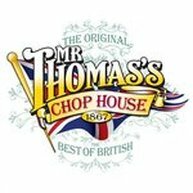 CitySession - Michael Taylor in conversation with Mike Emmerich, Chief Executive, New Economy on at Mr Thomas’s Chop House. As a former official in the Treasury and at 10 Downing Street, Mike Emmerich knows the mechanics of government. Football has become a unique industry with an unparalleled global appeal. The Business of Football however is complex, yielding billions, yet harbouring astronomical debts. What do the experts say about the current state of what essentially is a social pastime... or is it? 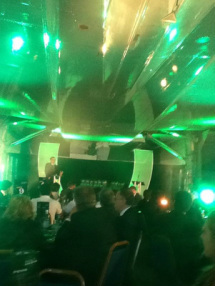 This was a Downtown event as part of Lancashire Business Week. A special Downtown Manchester breakfast seminar where Alan Switzer, Director in Deloitte’s Manchester-based Sports Business Group, presented the findings from the latest report, and looked at how the North West’s clubs are faring at a time when Europe’s richest and most popular sport is faced with the introduction new legislation. Frank Cottrell Boyce and Bishop Philip Egan were the guest speakers at a symposium at Aquinas College, Stockport. Novelist Rodge Glass and Guardian sports journalist David Conn discussed their latest football-themed books and the impact of recent developments on players and fans of our nation’s favourite sport. Rodge Glass is the author of two previous novels and the prize-winning biographer of Alasdair Gray. His satirical novel Bring Me the Head of Ryan Giggs tells the story of Mark Wilson who is recruited for Manchester United in the same class as Ryan Giggs but suffers a disastrous debut and sees their fortunes quickly divide. Lifelong Blues fan David Conn explores the history of his beloved club from a filthy habit in the 80s to today’s global entertainment business in Richer Than God: Manchester City, Modern Football and Growing Up. The event was chaired by Michael Taylor. The North West final of Young Enterprise was held on Thursday the 21st of June at the Concorde facility at Manchester International Airport. It was won by Fruity Friends, an amazing team from Wilmslow High School in Cheshire. Michael Taylor, founder of Think More, hosted the event as part of his contribution to Young Enterprise, a social enterprise committed to promoting entrepreneurship amongst school age children.